Below are many frequently asked beaver questions. Feel free to contact us with any other questions on beavers or beaver control methods..
Beavers are typically timid and shy animals that prefer to remain a distance from humans in the security of the water. They will slap their tails on the water to try to frighten enemies away and alert family members to potential danger. However, to protect their home territories they may attack an unrelated beaver or a perceived predator swimming in their pond. Why Not Just Kill Problem Beavers? Coexisting with beavers whenever possible is in everyone’s best interest. Beavers are a Keystone species which means that the environmental changes they cause have far reaching and important benefits for biodiversity and our environment. Beaver dams also provide many direct benefits to humans. See “What Good Are Beavers?” Flow management devices (e.g. culvert devices, pond leveler pipes, beaver deceivers, beaver baffles, etc.) offer the opportunity to resolve most beaver dam flooding problems nonlethally, in the most cost-effective, long-term, environmentally friendly, and humane manner. Most trees can be protected from beaver chewing with beaver fencing or other methods. See Tree Protection. What is a Flow Device? A flow device is a water control system that controls beaver damming activity to eliminate beaver-related flooding problems. These beaver drainage systems include specially designed fence systems to protect road culverts, (e.g. Keystone and other fence systems, Diversion Dams, beaver deceivers, beaver baffles, etc.) or various Pond Leveler pipe systems to control water levels at beaver dams. Why Use a Flow Management Device? Properly designed and installed flow management devices offer year-round protection from beaver damage to human property. They also protect human health and safety, save time, save money, and remain effective for many years with little maintenance. In addition, flow devices allow beavers to create and maintain ecologically valuable wetlands. They are proven to be long term solutions to beaver problems that benefit both man and the environment. In our experience the vast majority of beaver-related flooding problems are best solved with flow devices. They allow us to “Work with Nature” by coexisting with beavers and are the most long-term, cost-effective, humane and environmentally friendly beaver control methods available. How Do Flow Devices Work? The four primary types of flow management devices are, Pond Leveler pipes for beaver dams, Culvert Protective Fences, Fence and Pipe Devices, and Diversion dams. Each works is a different way. Beavers are stimulated to build their dams by the sound or feel of running water. A well-designed Pond Leveler pipe prevents beavers from detecting the flow of water into the pipe so beavers do not try to block it. Culvert Protective Fences decrease damming stimuli and make a road culvert no longer an easy place for beavers to dam. Fence and Pipe Devices use a combination of these two flow devices to allow some beaver damming yet still keep road culverts and man-made drainage structures functioning normally. Diversion dams give beavers an easy place to dam so they leave the road culvert undammed. The specific conditions at each site determine which flow device is most appropriate. A professional Site Assessment from Beaver Solutions LLC can determine this for you. Are Flow Devices High Maintenance? Any man-made device exposed to the elements requires some maintenance. While our flow devices are designed to be very low maintenance, the little maintenance that is required is important. Our Flexible Pond Leveler pipes should be inspected each spring for winter ice, beaver or other damage or if the pond level ever rises unexpectedly. Culvert Protective Fences should be inspected three to four times a year to remove any accumulated stream debris from the fence. Typically this is done after autumn leaves, spring runoff, and large debris-producing storms. This maintenance can be done by one person and usually takes less than fifteen minutes per cleaning. When this routine maintenance is performed as recommended, flow devices should remain effective for many years. Our Fence and Pipe flow devices typically only require a few minutes of routine maintenance twice annually. Because we are committed to the success of our installations, Beaver Solutions™ offers an optional maintenance plan at a very low-cost. Why Not Relocate the Beavers? Here in Massachusetts and many other states it is against the law to relocate wildlife. This is because many animals that are removed from their home areas (including beavers who are very territorial), suffer and die. In addition, relocating wildlife can just transfer the problem to someone else’s property and can contribute to the spread of wildlife disease. When relocation is not an option any trapped beaver should be killed in a humane manner. According to Euthanasia Guidelines from the American Veterinary Medical Association trapped animals such as beavers should never be drowned. Beaver relocation programs have been initiated in some western U.S. states where beaver densities are lower than desired. In 1985 Sherri Tippie founded Wildlife 2000 in Colorado and she has successfully relocated hundreds of beaver families that otherwise would have been killed. More recently other western states have started more relocation programs. These programs relocate an entire beaver family unit from an area where conflicts with humans are occurring, to suitable habitat where the benefits of beaver dams are needed for salmon recovery, stream restoration, biodiversity, water storage, etc. However, many relocated beavers do not survive relocation. Therefore, whenever possible it is best to leave beavers where they are and implement long term solutions for any conflicts. 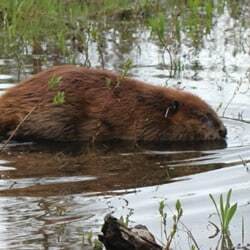 Beaver Solutions LLC™ offers licensed, humane beaver trapping services in MA. Trapping to remove all the problematic beavers may be necessary in areas where flow management devices or other nonlethal beaver control methods are not feasible, such as sites where there is little or no tolerance for any water level elevation from a beaver dam. Beaver removal and trapping should only be used as a last resort. Beaver trapping has drawbacks which include: in most regions the trapped beavers must be killed rather than relocated, trapping is usually a short term solution because new beavers will recolonize the habitat, and the elimination of the beaver colony results in degradation of the beaver dam and the loss of valuable wetland habitat. Are Permits Needed in Massachusetts to Trap Beavers? Trapping and Wetland regulations in each state and province are different. Check with your Department of Wildlife or Environmental Protection for the the regulations in your region. In Massachusetts, recreational beaver trapping season starts November 1st and ends April 15th each year. Only live catch traps are allowed and no permit is necessary for state licensed trappers to catch beavers during trapping season. However, at any time of year if there is a beaver-related threat to human property, health or safety, the local Board of Health can issue a 10 Day Emergency beaver permit to trap the beaver using lethal Conibear traps, breach the dam, and/or install a flow device. In MA, Conservation Commission wetland permitting is also needed to breach a beaver dam or install a water control device. When Board of Health issues a 10 Day Emergency beaver permit the process is expedited. No public hearing is needed. 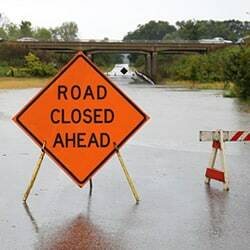 The local Conservation Agent will simply review the plan to breach the dam or install a flow device and they will issue an Emergency wetland permit with any conditions they deem appropriate. In Connecticut, this oversight is done by the Inland Wetlands Commission in each town. A Conservation official’s role is to ensure that potential negative impacts to the wetland resource are minimized.